breaking. With Milwaukee’s attention to blade material, tooth shape and sharpness, the jig saw blades produce clean, fast cuts in nail-embedded wood. The T-shank allows for quick installation. 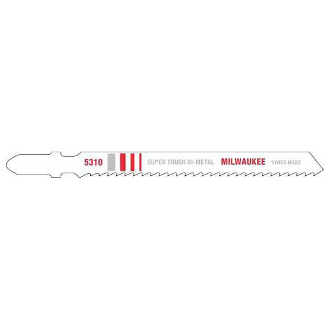 Use with Milwaukee jig saw models 6266-6, 6276-6, 6267-20, 6267-21 and other popular brands.